Embleema, the leader in blockchain for health, announced today that it has closed a $3.7M Series A funding round, led by strategic partner Pharmagest, a leading pharmacy software group in Europe, and Techstars. The funds will serve to accelerate the joint development of blockchain-based applications for patients and pharmacies, and further Embleema's commercial deployment. 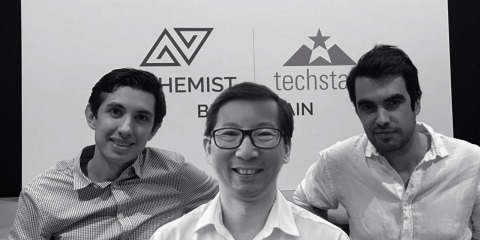 Joining the 3-month Alchemist Blockchain Techstars Accelerator will enable Embleema to gain access to more than 150 mentors including Internet pioneer Jeff Pulver (News - Alert), Gary Rubinoff, Managing Partner of Alchemist Capital, a venture fund focused on blockchain, Trevor Koverko, CEO of Polymath, Leanne Kemp, founder & CEO of verledger, or blockchain pioneer Steven Nerayoff, involved in top projects including Ethereum. The accelerator also provides investment capital to participating companies. Techstars, the worldwide network that helps entrepreneurs succeed, and Alchemist, a global blockchain advisory group, have partnered to bring a new mentorship-driven accelerator program to New York City: Alchemist Blockchain Techstars Accelerator. Yossi Hasson of Techstars and Steven Nerayoff of Alchemist will lead the program along with other mentors and experts from both companies. The Accelerator will help Embleema founders gain access to expertise in the nascent - yet rapidly growing - cryptocurrency and blockchain industry, helping them do more faster. Selected companies will not only benefit from resources across Techstars and Alchemist's ecosystems, but will also have the opportunity to work closely with leading market players in the blockchain industry. "We're excited to welcome Embleema to our newest accelerator program, and help them succeed by connecting them with leading blockchain industry players," said Yossi Hasson, Managing Director at Techstars. "We believe in the vision of Embleema's management team and their ability to set a new benchmark in sharing patient data for research, ultimately giving every individual more control and participation to accelerate research and clinical development." Robert Chu, CEO and Founder at Embleema added: "Our successful Series A funding round and integration into Techstars' Alchemist Blockchain program will enable us to accelerate the release of the first decentralized marketplace for health data. Health data owners such as patients, health networks and research centers will be able to exchange more relevant and faster data with life sciences companies and regulators such as the U.S. Food and Drug Administration (FDA) in a real-time, secure and continuous manner, while ensuring full patient consent, thus accelerating the release of new treatments for patients." Embleema is the patient-driven healthcare blockchain network for secure sharing of personal health records. Hosted on a private Ethereum blockchain, Embleema's consolidated, highly-secure repository provides the healthcare ecosystem with an undisputed and holistic view of patients' medical history, Embleema is creating a decentralized healthcare data economy by connecting the key stakeholders in the healthcare industry, directly with patients while maintaining the patient's data sovereignty. CEO Robert Chu left his role as Senior Vice President, Global Technology (News - Alert) Solutions at IMS Health to found Embleema in June 2017 and is supported by a team of healthcare and technology executives from Harvard Medical School, T-Systems, the Pharmaceuticals Division of Pierre Fabre and iBionext and Nokia (News - Alert) / Withings Digital Health. For more information, please visit www.embleema.com and follow Embleema on Twitter (News - Alert) @Embleema, Telegram, LinkedIn, and Facebook.